I love kumquats. I discovered that the Vietnamese adore them when I found a drink sold in many stores: fresh sugar cane juice with kumquat juice. Kumquat peels are sweet and edible and the fruit inside is sour. So adding kumquat is akin to adding sour lemon to something sweet. Instead of putting lime juice in coconut water, try kumquat. 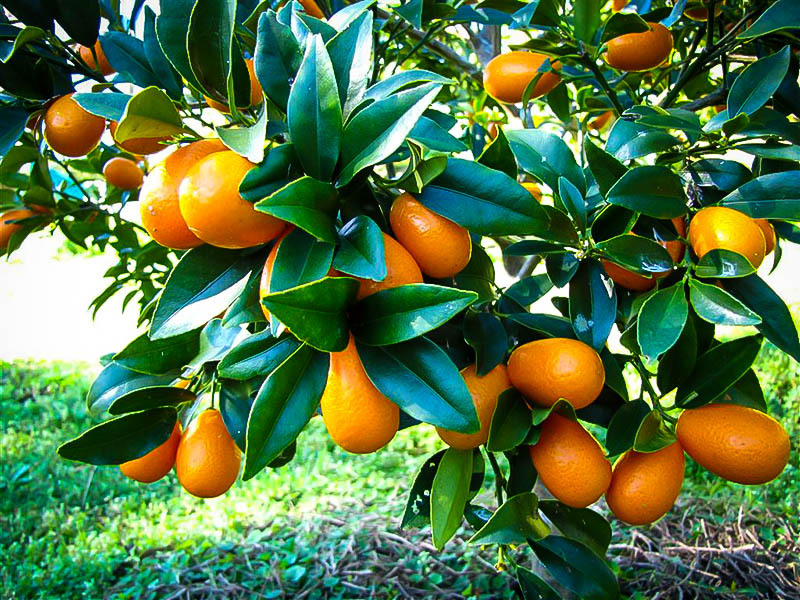 I grew up thinking there was only one kind of kumquat, the Nagami, which is the common one sold in stores. But there are several. Recently I bought a semi-dwarf from China called Meiwa. It is reported to be sweeter than the nagami. The fruit is still green. We shall see. This is an article about the different varieties of kumquats. Edited 2 time(s). Last edit at 12/12/2018 04:04PM by Tai. I am more into more fruits and less greens these days. Can they be grown indoor? Edited 2 time(s). Last edit at 12/13/2018 07:30AM by RawPracticalist. Can they be grown indoors? Yes and buying a dwarf or semi-dwarf is best for growing indoors. Some kumquat varieties are more cold tolerant but keep in mind that if citrus freezes, it's ruined, so temps inside have to stay citrus friendly. It would be interesting to see if you can buy a citrus tree locally or if you would have to have it mailed to you. This little dwarf I bought is only knee-high but it has a decent amount of fruit. I got to eat hybrids of kumquats: mandarinquats and limequats. Delicious! The peel was semi-sweet on the mandarinquat and slightly sour on the limequat. The fruit of the limequat was so tasty yet sour. I also got to eat fingered citron, aka buddha's hand. You can add it as zest to food and also eat it as a snack. It sweats in a plastic bag and oils come out. Best to leave it on a counter with nothing touching it. I was at an Asian market and they were selling pomelos at a steep discount because the peel had turned soft and deflated, almost mushy. I love them that way because they are at the ripest and easier to juice. I bought like 25 lbs for like $8! I am going to juice the sweet lemons with them. The Asian stores are awesome for finding good deals. What does buddha's hands taste like. I saw it at a store once but never got it. Does it taste like a lemon or an orange or both? Kumquats are interesting. It is like getting the tiniest miniature orange and biting into its skin and finding out it was a lemon! The meiwa kumquats are a sweeter variety from China. When fully ripe, they are not really sour. Just slightly. Basically you bite into them, chew the entire fruit, peel and all and spit out the seeds with no sour grimace. It's pleasantly wonderful with a hint of astringency, provided they are FULLY RIPE. The Meiwas are so different to the Nagami. I used to eat the skin of nagamis and spit out the fruit when I was a kid. Actually, the nagamis are great juiced, skin and all. Cut up, the nagamis can be used as a lemon replacement. Pectin is very healthy, so it's beneficial to eat citrus skin and kumquats have the best skin to eat. The Meiwa kumquat tree is a treasure to have. The dwarf tree takes up so little room.